My Home is the homepage of Connect. Unit selector — A dropdown menu that shows all the units you’re currently enrolled in. You can also pin units, which will show up in your My Units widget on the homepage. Navbar — The navbar contains links to useful items like your Overall Progress, links to Other Systems (like the Library Catalogue) and links to Help & Support resources. Messages, subscriptions, notifications and profile — These icons will notify you if you’ve received notifications or messages, and your profile will allow you to customise your own settings in Connect. My Units — These are colourful tiles that allow you to quickly access your units. You can search for and pin (or unpin) additional units, up to a total of 25. 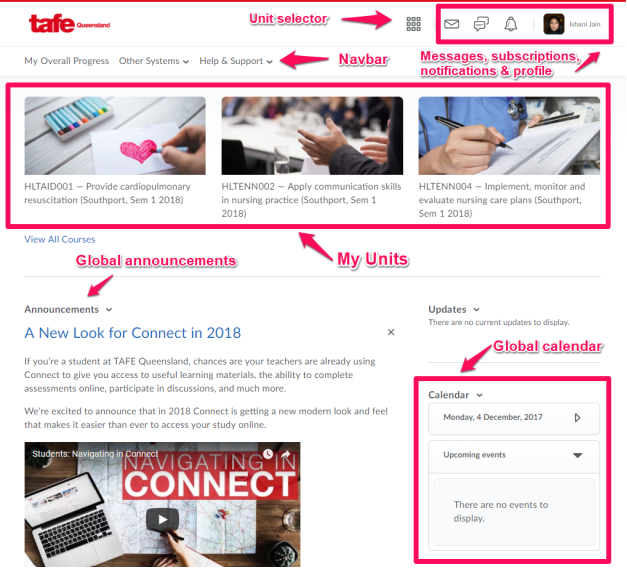 Global announcements — Important updates and news for all of TAFE Queensland. Global calendar — Events for all of TAFE Queensland.